1. 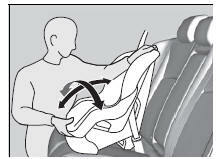 Place the child seat on the vehicle seat. 2. Route the seat belt through the child seat according to the seat manufacturer’s instructions, and insert the latch plate into the buckle. Insert the latch plate fully until it clicks. 3. Slowly pull the shoulder part of the belt all the way out until it stops. This activates the lockable retractor. 4. 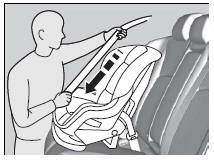 Let the seat belt completely wind up into the retractor, then try to pull it out to make sure the retractor is locked. If you are able to pull the shoulder belt out, the lockable retractor is not activated. Pull the seat belt all the way out, and repeat steps 3 ’ 4. 5. 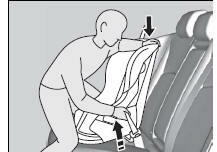 Grab the shoulder part of the seat belt near the buckle, and pull up to remove any slack from the lap part of the belt. 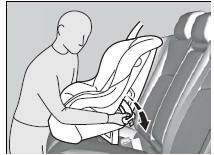 When doing this, place your weight on the child seat and push it into the vehicle seat. A child seat that is not properly secured will not adequately protect a child in a crash and may cause injury to the child or other vehicle occupants.